In the last days several news about Tango where made public, where some new screen shots from an Windows Phone Tango (although Microsoft does not call it like this) ROM are imaged. The images are originally from xda-developers and WP7forum.ru. Update 1: More apps in TaskSwitcher – NOT! Yesterday I reported about the leaked news that Tango will have an increased task ability of 8 apps. As stated by HD2Owner on xda, this is a cooked in feature, not a real one. Sorry for the confusion. As you can see on this picture, the xda-devs made a comparison between the actual version 8107 and the awaited Mango refresh with version 8773 (a cooked ROM). There is less memory usage on the newer build. Whether this is on final build like this or not, we can actually not say. It makes sense that the new version does use less memory, as there will be certain devices with only 256 MB. And Microsoft will for sure make Windows Phone as fast and fluid as we know already also on these devices. As you can see on this shot, there are new settings for delivery confirmation and acknowledgement. 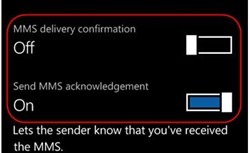 We will also be able to use multiple attachments in one MMS, but his might be a carrier-dependent settings. Background info: there are certain carriers which have a size limit on MMS, so this will maybe not available on all devices. If an app is not able to run on a 256 MB-device, the marketplace tells you that for your device the app is not available. So this will lead to an still fast and fluid user experience, just because you cannot install memory-eating apps . I will update this post as soon as new information are showing up. This means that this update will increase battery life in the devices? for the moment it tells only it uses less memory. If this will have an impact on battery life, we will see after we installed it on our phones. My Titan’s battery life although is great (heavy user, it lasts one day w/o switching off).